Amenities abound at Treehouse Condos with a large clubhouse which includes an indoor pool, hot tubs, sauna, racquetball court, arcade and billiards, lounge area for larger groups and outdoor tennis courts in the summer. The Wildernest area also has many hiking and biking trails steps from Treehouse Condo. 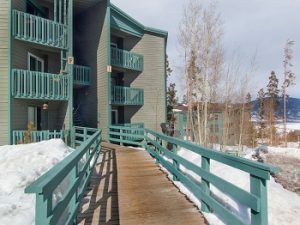 These Silverthorne condos are also on the bus route for easy access to any of the four Summit County ski resorts, the Silverthorne outlet malls and other areas within Summit County. In 2008 four additional Treehouse condos were built and named The Village at Treehouse. These four units live more like duplexes. Three of the units are 3 bedrooms/3 bathrooms with 1,501 square feet and the other unit is 4 bedrooms/4 bathrooms with 1,814 square feet. The Village at Treehouse units are affiliated with the Treehouse Condo HOA and have use of the same Clubhouse and amenities. For additional information about Treehouse Condo or to arrange a time to view any of the properties for sale (see below) contact Justin and Krystal Knott with Fuller Sotheby’s International Realty. As full time, experienced Summit County Realtors we can also assist you with any Summit County Real Estate that is for sale.